Richard Feynman (11 May 1918 - 15 February 1988) was an American physicist. He was born in Far Rockaway, Queens, New York City. He was part of the Manhattan Project team that made the atomic bomb. Feynman won the Nobel Prize in Physics 1965. He was one of the first people to study quantum physics. Feynman added significantly to a branch of science called quantum electrodynamics and invented the Feynman diagram. He died of liposarcoma in Los Angeles, California. His sister Joan Feynman (born 1927) is a retired astrophysicist. Feynman wrote some best-selling autobiographies, and his lecture notes became popular with physics students and qualified professionals. Feynman, Richard P. (1985). Ralph Leighton, ed. Surely You're Joking, Mr. Feynman! : adventures of a curious character. W.W. Norton. ISBN 0-393-01921-7. Feynman, Richard P. (1988). Ralph Leighton, ed. What Do You Care What Other People Think? : further adventures of a curious character. W.W. Norton. ISBN 0-393-02659-0. Classic Feynman: all the Adventures of a Curious Character, edited by Ralph Leighton, W.W. Norton, 2005, ISBN 0-393-06132-9. Chronologically reordered omnibus volume of Surely You're Joking, Mr. Feynman! and What Do You Care What Other People Think?, with a bundled CD containing one of Feynman's signature lectures. No Ordinary Genius: the illustrated Richard Feynman, ed. Christopher Sykes, W.W. Norton, 1996, ISBN 0-393-31393-X. Six Easy Pieces: essentials of physics explained by its most brilliant teacher, Perseus Books, 1994, ISBN 0-201-40955-0. Six Not So Easy Pieces: Einstein's relativity, symmetry and space-time, Addison Wesley, 1997, ISBN 0-201-15026-3. Feynman: the graphic novel. Jim Ottaviani and Leland Myrick, ISBN 978-1-59643-259-8. Feynman, Richard P.; Leighton, Robert B.; Sands, Matthew (1970). The Feynman Lectures on Physics: the definitive and extended edition. 3 volumes (2nd ed.). Addison Wesley (published 2005, originally published as separate volumes in 1964 and 1966). ISBN 0-8053-9045-6. Check date values in: |publication-date= (help) Includes Feynman's Tips on Physics (with Michael Gottlieb and Ralph Leighton), which includes four previously unreleased lectures on problem solving, exercises by Robert Leighton and Rochus Vogt, and a historical essay by Matthew Sands. 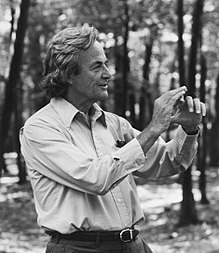 Wikimedia Commons has media related to Richard Feynman. This page was last changed on 28 June 2018, at 00:54.